Valve Steam Box games console incoming? Valve is looking to bring its gaming nous to hardware, with the launch of the Valve Steam Box, a dedicated console set for 2012. This is according to The Verge, which has it on good authority that Valve is looking to expand into the hardware market and has been showing off its console to select members of the gaming community. 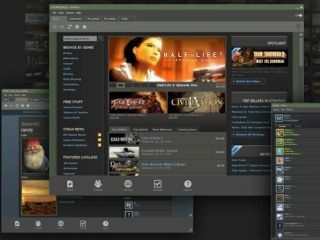 According to the rumour mill, the console will use Steam's Big Picture mode, which allows gamers to play Steam on a big screen TV via a PC or Mac. It is also set to be revealed at this year's E3, but it could well be shown off at GDC – a show that's taking place in San Francisco from today, until the 9 March. If Valve were to release some sort of hardware it looks as if it would be going into competition with streaming service OnLive, which has proved that cloud gaming can be a success. The idea that Valve would enter the hardware market isn't that far-fetched. Valve's Gabe Newell told TechRadar back in February that the company would consider creating a console, or some other device but it wasn't top of their list. "If we have to sell hardware we will," Newell explained. "We have no reason to believe we're any good at it, it's more we think that we need to continue to have innovation and if the only way to get these kind of projects started is by us going and developing and selling the hardware directly then that's what we'll do. "It's definitely not the first thought that crosses our mind; we'd rather hardware people that are good at manufacturing and distributing hardware do that." Valve famously never rushes anything out, so even if it is creating hardware we may have long to wait. But if something did indeed arrive this year, we can think of a perfect launch title – Half-Life 3, anyone?